We like the MX-5. Famously inspired by British sports cars of the 50’s and 60’s it single-handedly relaunched the market for affordable rear wheel drive sports cars, and for this we will be eternally grateful. Inevitably however the purity of the first MX-5 has been chipped away at with each new model gaining weight and losing a little bit of the early magic. This is Mazda’s response. The determination to get it right can be seen in the key attributes of the chassis. Not only is it perfectly balanced with 50:50 weight distribution, it is also front-mid engined which means that the engine is behind the front axle. This is something that is normally reserved for full blood sports cars where the engineering difficulty can be offset against a weighty asking price. Was it worth the effort? Absolutely. There is minimal inertia on turn in which means that you get an instant response on corner entry and then if you carry enough speed a neutral stance develops. 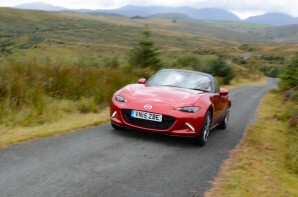 It may not be great at show-boating but it is great fun to get the Mazda on its toes as it really responds to a smooth committed driving style. Alongside the new chassis there are also new engines with this 1.5 giving the best fuel consumption. It is part of the SKYACTIV range which forgoes turbo charging and instead employs an unusually high compression ratio to make the engine more efficient. It is another example of Mazda’s free thinking attitude and provides an interesting counterpoint to the ubiquitous downsized turbo petrols now on the market. It is down on torque but with max power arriving at 7000 rpm and torque at 4500 rpm it requires wringing out which seems entirely in keeping with the ‘old school’ mandate. The MX-5 is back with a bang. The interior is very well laid out, attractive, and has a unique identity; It has a modern infotainment system with a controller which is always easier than touchscreen; It is now respectably efficient and performance remains sprightly. Crucially it is great to drive and remains affordable and for this reason it gets a Green Car Guide ‘highly recommended’.